"Limestone Jags and a Granite Tor"
Beaver Creek Wild and Scenic River is an Interior classic canoe trip, that's either way too long and boring in its lower section (300 miles to the Yukon River Bridge) or an expensive flight out from Victoria Creek. 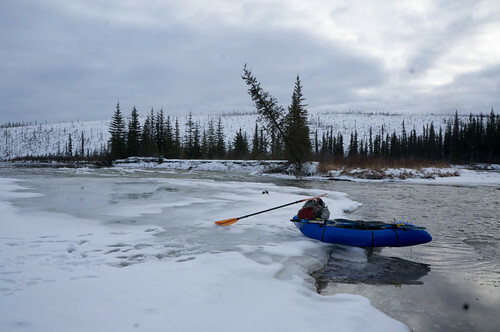 It's got a great put in on Nome Creek, about 18 miles on a gravel road off mile 57 of the Steese Highway. 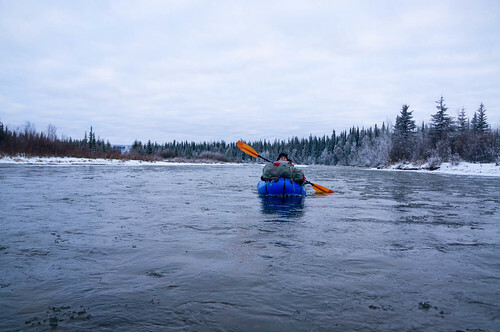 Last week (the timing was good -- in between bugs and snow which made the walking delightful) my daughter Jazz and I did a 45 mile float and 45 mile hike that included the best Interior hiking I have ever done, and this after living in Fairbanks from 1977-1988 when I did quite a few trips in the Fairbanks area. Beaver has NO whitewater. It's better suited for beginners who also want to do some raft packing, rather than just a boating trip. No need for dry suits. Rain gear is great. Jazz and I paddled a special made Alpacka, 57 inches long inside (4 inches longer than the Dory). It's also parallel sided - no pointy bow like the smaller boats. She sat in the front and I sat in the back. We both faced forward. She sat on her pack. I sat on the seat and put my pack on the very back of the boat. We had none of the bending issues that you'd expect with a long boat. We tried paddling canoe style but it was not nearly as efficient, fast, or fun as paddling with two kayak paddles. We did 45 miles in two days easily paddling with our 4-piece, 215 cm Werner paddles that we carried in two pieces, as the brush is never bad. The hiking included walking among the wonderful Limestone Jags -- innumerable towers, fingers, walls, spires, and natural arches of limestone that make up the Limestone Jags along the crest of the White Mountains. We followed bear trails up Fossil Creek and over to Obrien Creek (climbing a wonderful granite tor en route) then walked through the 2003/2004 burns (which tame tussocks nicely) back to Beaver Creek to Roy Creek, which we walked upstream along four miles back to the start. 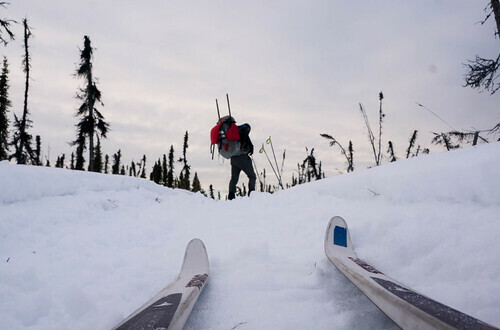 There are cabins, too, used by snowmachiners, mushers and skiers. Stay off the snowmachine trails as they are a boggy mess. Follow the animal trails through the gallery forests along the creeks, if you go. I'd give it Alaska Classic status (4-stars). We saw a bald eagle, goshawk, gyrfaclcon, nesting red-tails, a bunch of short-eared owls, a hawk owl and I even got a photo of a great gray owl that was being harassed by a merlin. We saw sheep, moose, and the biggest wolf I have ever seen swam the river in front of us. Lots of nesting song birds, too. Anyway, I have a tendency to get wrapped up in the burly whitewater trips but thought I'd float this out there as a good trip for people at the Twenty Mile stage who want a longer adventure with great hiking (expect wet feet!). It will likely be good for another week or two, until those mountains leaf out and the mosquitoes come out, too. Then it will be out of condition until the Fall colors of September. 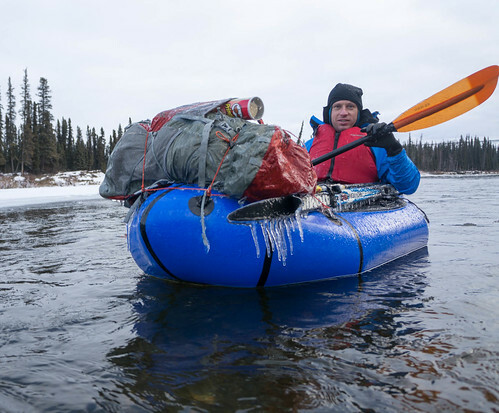 Off the subject and a long time since ever talking, but, I fell upon this website and saw packrafting seems to be back. So, I pulled my Sherpa packraft out and blew it up for the first time in ten years, saw it still was in mint condition, went for a float, and decided to upgrade. So, I still have my original Sherpa packraft from Alaska days and I wanted to sell it. I posted it for sale internal to this website and have had two interested parties. However, I have absolutely NO idea on its value. Both parties would like a price, I'd appreciate your opinion on what you might think it would be valued at these days? Got any ideas? I did a shorter float on Beaver Creek a couple of days ago, and skied out to the Wickersham Dome trailhead - the classic Nome Creek to Mile 28 float, but there is now enough snow for skiing, so we skied to mile 28. It made for a great trip given the unusually high late season water levels. A bit more info can be found here.